You know that one author whose books you reach for when you need the equivalent of a reading hug? Or maybe it’s just one book, but the prose somehow exudes cozy? Yeah. I have a whole shelf of those, and the name on the spine is Robin McKinley. Her books are great for anytime (they’re almost all about girls doing things), but I find my eye catching on that particular shelf most often whenever I’m in a rough patch. I’m in the midst of one right now – first I fractured my face playing hockey, then I got quite ill, right now I’m dealing with pest problems, and as a result my roommates and I have decided to move at the end of the month (whew!). So I picked up a McKinley book to (re)read myself into a better mindset. Chalice is a quietly powerful book, and it’s working like a healing balm for my soul. Mirasol was a modest beekeeper before a terrible tragedy forced her into a position of power. The trouble is that she has had no training, a new Master, and work that must be done, or else everything will fall apart. Mirasol’s struggles are not small and simple as they once were: she is trying to hold together something much bigger than herself, while fighting ignorance (her own and others’), politics, and self-doubt. Chalice is a quiet book, focused on one woman thrust suddenly into a life she could never have imagined. At the same time it is a powerful story about an understated type of heroism – that of an ordinary person, stretching to (and past) their limits to make the world a better place. That’s the story. What about the writing itself? I’m going to tell you what it’s like, and you’re going to give me a look and think, “Cecelia, are you serious?! That sounds boring.” And I’m going to say… just hear me out. McKinley is as her most McKinley-esque in this book: there’s little dialogue, the story is told in the third-person, and there’s a lot of exposition, a lot of time in spent in main character Mirasol’s head. Stay with me. It’s a cozy, warm sort of story for all that. Said coziness comes from: honey, Mirasol’s affinity with animals & bees, her modesty and thirst for knowledge, and the juxtaposition of the physical limits of the human body (small, immediate concerns) with “larger” matters like a land falling apart, loneliness, and the responsibility of power. The writing may not be galloping-along-action, but it’s suited to the size and scope of this story, and it perfectly represents the main character. The first couple of times I read Chalice I simply read it, and was pulled into its calm. This time through I enjoyed it just as well as before, but I kept a somewhat more critical eye out – as I have been doing with all of my reading lately. Conclusion? Although the book’s focus is narrow, room could have been made to explore some interesting themes. I’m talking “issues” like gender stereotypes (inherent in the assigned power roles in this fantasy world, as it turns out), diversity (the Master has black skin that has been burned by magical fire, but otherwise there’s a monochromatic cast of characters), and world-building (what is lost with the hyper-focus on one woman?). As I said, I still enjoyed the book – but I am working on my awareness of diversity. My reading requirements have evolved. 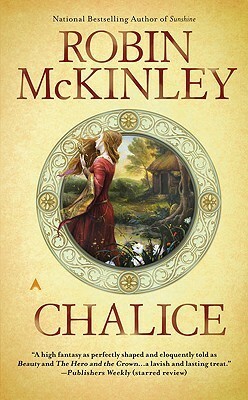 In all, Chalice is a warm, genuine sort of fantasy – the type of story that will appeal to readers who don’t usually find themselves in the fantasy section at the bookstore but want the book equivalent of a cup of tea and a fuzzy shawl around the shoulders. Recommended for: readers who prefer quiet, character-driven stories, anyone interested in books light on dialogue and heavy on beekeeping, and fans of Patricia McKillip. i recently discovered your blog and i really like it so here you have a new follower! These pictures are lovely, now I really wanna go book-shopping.